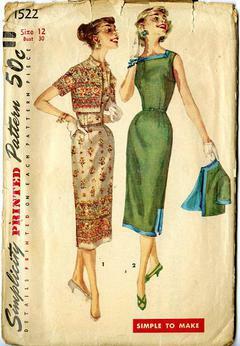 1956 Simplicity #1522 vintage sewing pattern, Junior Misses' and Misses' one-piece dress and jacket. This 'simple to make' sheath dress is sleeveless and has a square neckline and slim skirt. The short, fully lined jacket may have a mandarin collar or be collarless. Sleeves are short.